How does a watchman function? Are all prophets watchman? 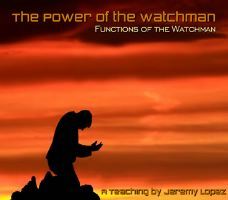 Is a watchman the same as an intercessor? This teaching will train and teach you how watchman war, fight, stand in the gap and most importantly, know how to hear the voice of the Good Shepherd. A MUST FOR PRAYER WARRIORS, PROPHETS AND INTERCESSORS! Jeremy Lopez is Founder and President of Identity Network International . We are an apostolic and prophetic resource website that reaches thousands of people around the globe and distributes books and teaching CD's on the prophetic move of God. He has prophesied to people from all walks of life such as local church congregations, producers, investors, business owners, attorneys, city leaders, musicians, and various ministries around the world concerning areas such as finding missing children, a financial breakthrough, parenthood, and life changing decisions. This prophetic ministry that desires to see every believer awake to their destiny. Jeremy releases the prophetic word of God everywhere he goes through a strong prophetic anointing and with a manifestation of the Kingdom of God. He ministers with a revelational prophetic teaching gift that brings a freshness of the word of the Lord to the body of Christ. He teaches the principal that we are positioned in heavenly places and that we are called to minister out of that realm. He accomplishes this through conferences, prophetic meetings and church services. He serves on many boards across the nation including the Board of Directors of Kingdom Covenant International Ministries.